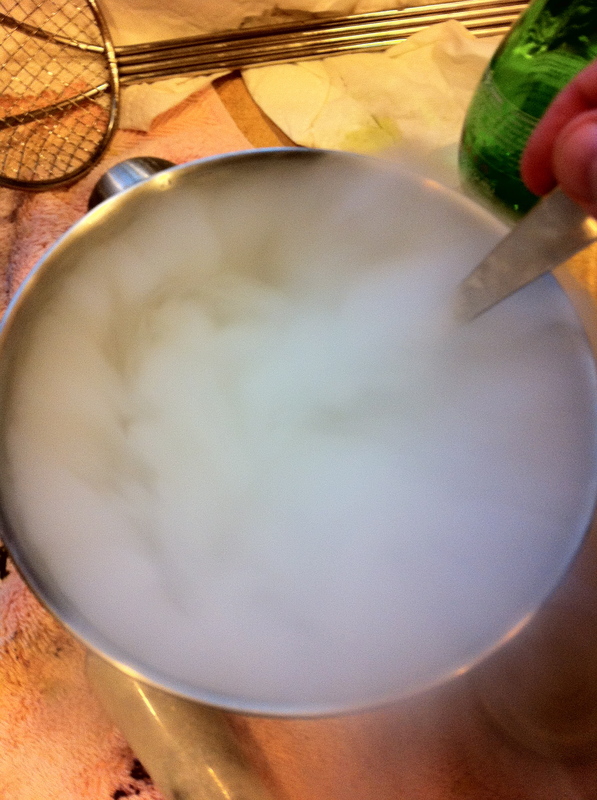 Continuing my free fall into contemporary cooking techniques, I wanted to work with liquid nitrogen for some seriously cold cooking. 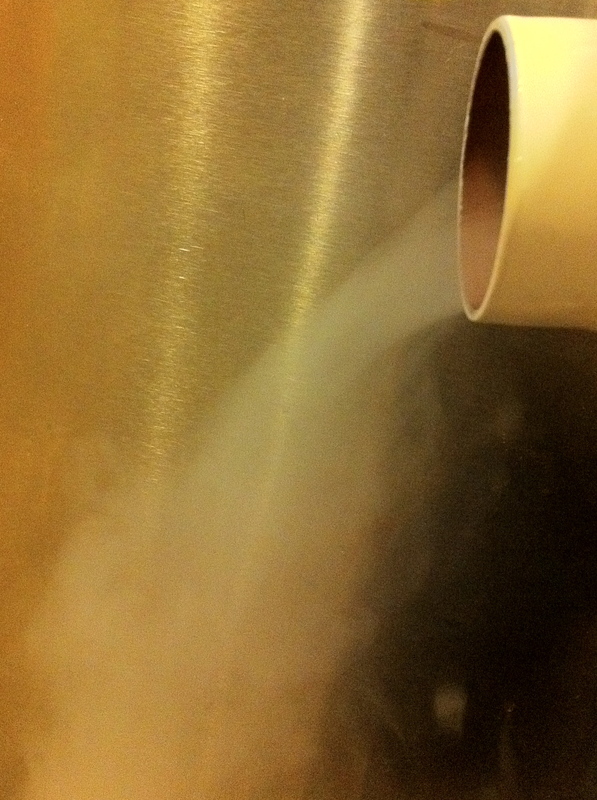 Liquid nitrogen is incredibly cold: −321 °F/−196 °C! 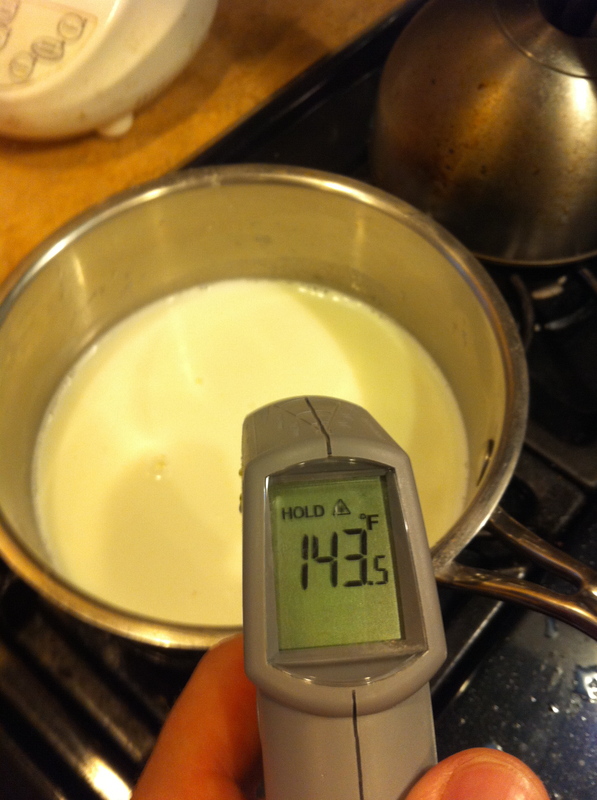 As it warms up, it boils away back into a gas, creating the exact opposite of a deep fryer – a deep freezer. This is the stuff that urban legend says poor Walt Disney is frozen in for possible future reanimation. My interests, however, are purely culinary. 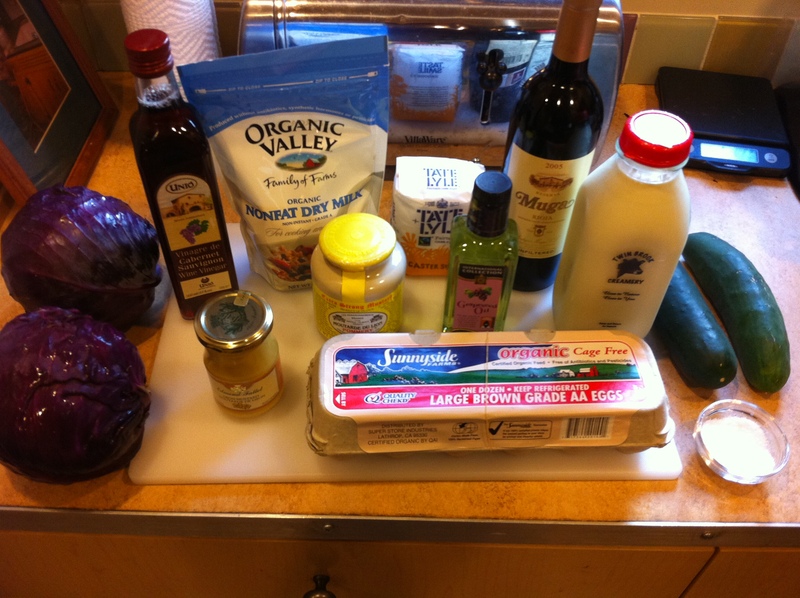 I wouldn’t be able to go to Sur la Table to get what I needed for this round of cooking. I instead went to my local provider of industrial gases and inquired about purchasing a small amount of liquid nitrogen (also known as LN). 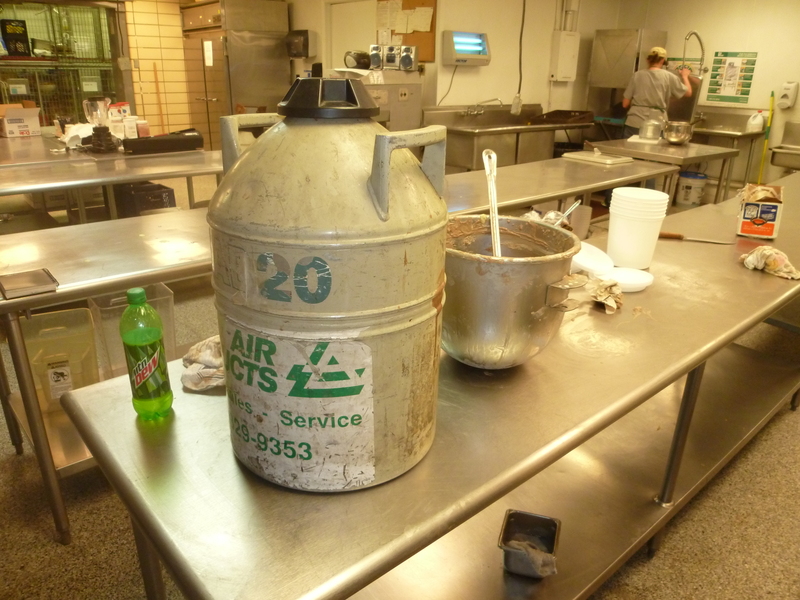 They said I couldn’t do it without the use of a dewar, a container especially designed for carrying and storing LN. So, I did some research online, waited patiently, and was able to score a small 5 liter dewar for 40% off list price on eBay. Do not keep LN under pressure in a closed container. It will explode. It can blow your hands off. Thus, a proper dewar is necessary. You can suffocate on nitrogen and die and you won’t even know it. Your body won’t warn you ahead of time. You must be in a well ventilated area. It is really, really cold. Avoid getting burned the same way you’d avoid hot oil. It was a cold wet day in Seattle when I went to fill my dewar up with LN, but I still drove home with the windows down, the dewar tightly strapped in the back seat surrounded by towels, determined to not get killed before I froze some foodstuffs at home for my amusement. I made it back safely and got down to some cold cooking. I placed a towel on my kitchen counter and placed a metal bowl inside of a larger metal bowl on top. This was in case the LN was so cold the first bowl cracked open. At least I would have a chance to get the thing outside if need be. The window above the counter was opened for ventilation. I decided to do a bunch of different things, some successful, others less so. But it gave me a good insight into what’s possible. First off was ice cream. 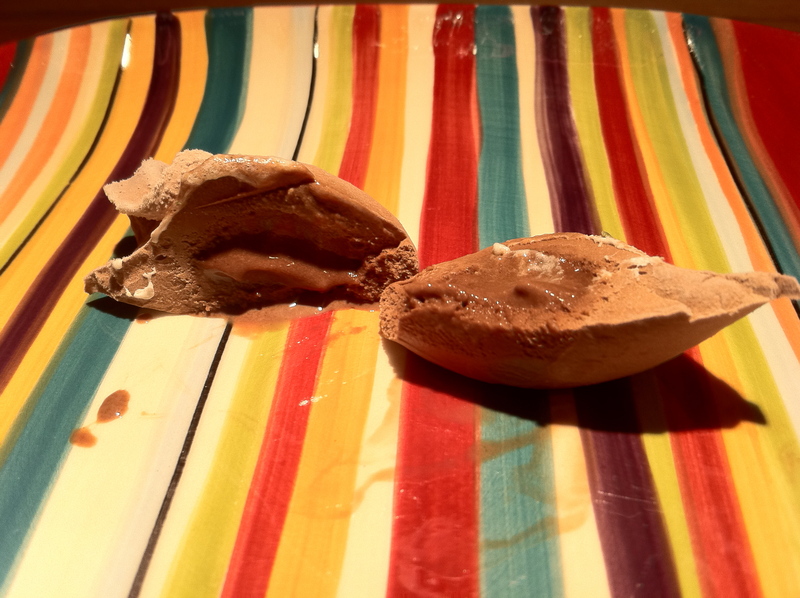 I was trying to make some ice cream bowls as Ferran Adria’s video showed in his talk at Google. At elBulli, they freeze an ice cream base on the underside of a ladle and then slip it off, creating a beautiful ice cream bowl to be filled with other goodies. I, however, couldn’t get the bowls off correctly from the ladle – they were frozen solid on there, and they would always chip and break. As my LN quickly evaporated, I decided to forgo that experiment after several tries and keep trying other techniques. I scooped up some ice cream and threw it in. It created a delicious little fudgesicle nugget, frozen on the outside but still creamy inside. 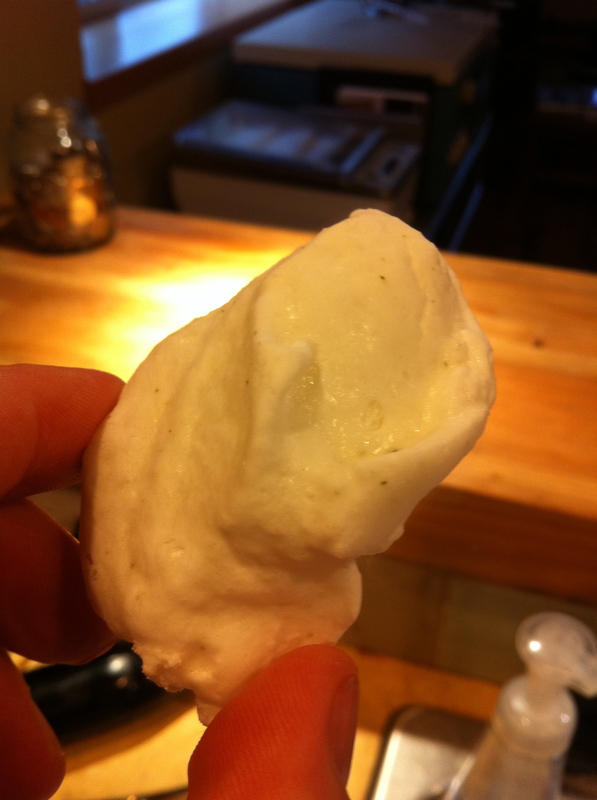 Next up was an idea for a frozen spruce meringue. 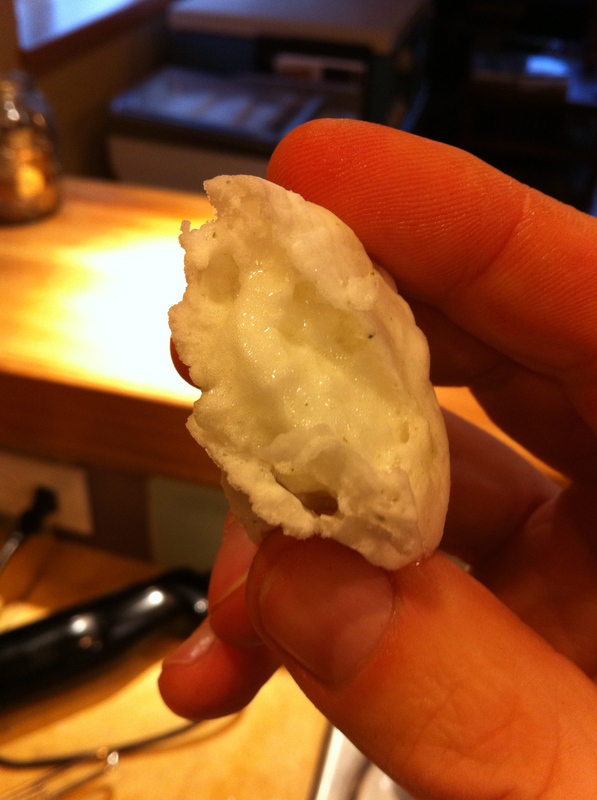 I beat some egg whites and sugar together until they were fluffy, and then added some spruce spice I made last week. It turned out great – cold, crunchy, and creamy. And forest-y. 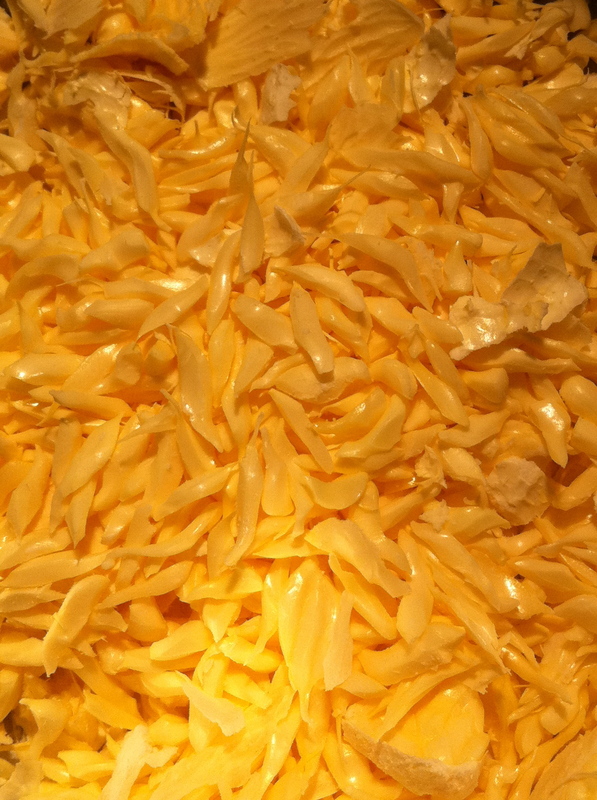 Next up – orange slices. After a quick freeze, I smashed them in a bowl to create an orange risotto. Finally, I messed with some alcohol. Alcohol doesn’t freeze in the freezer, but LN has no problem with it. 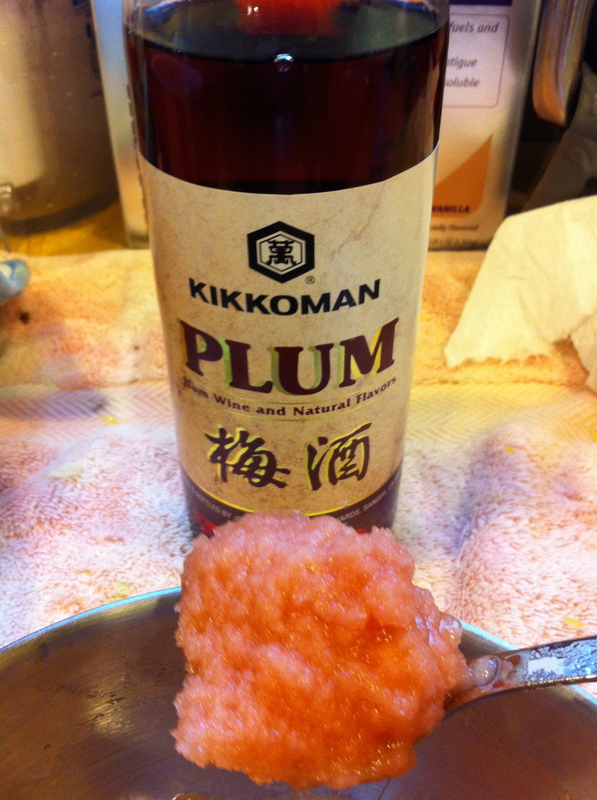 I took plum wine and poured it into a small bowl. 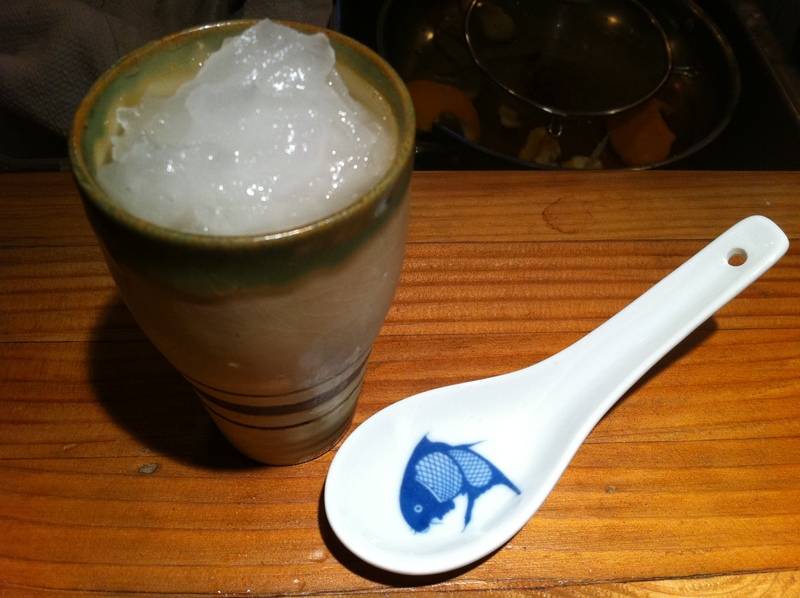 I then stirred in LN to create an Asian alcohol sorbet. 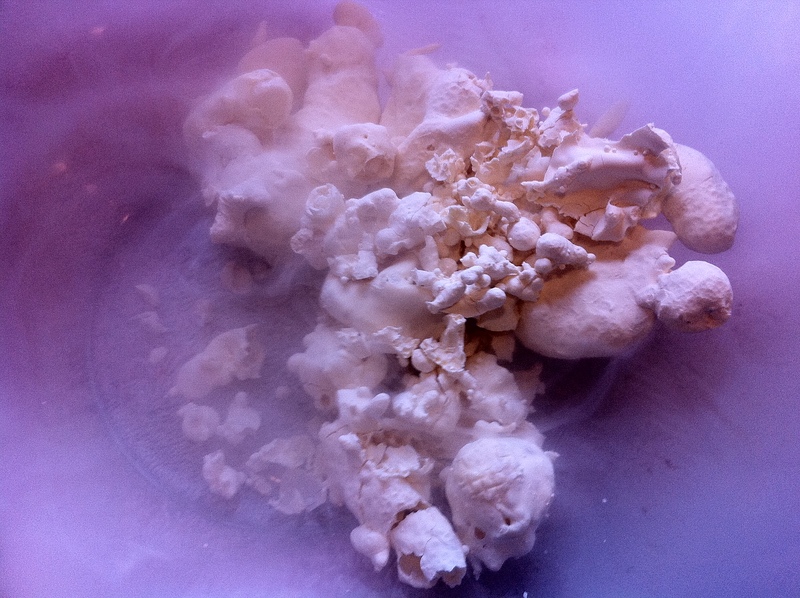 For the most part, my initial foray into the world of liquid nitrogen cooking was very successful. And addictive. With instant fudgesicles, ice creams and sorbets, I can see it being a big hit during summer BBQs. I know now someday when I get a new home, my kitchen will have a hot station, a cold station, and a very, very cold station. I had to spend the month of May in Denver, CO this year because of work. I grew up there, so I had family and friends to entertain myself, and was able to put my brother’s, sister’s and mother’s kitchens all to good use. But I also wanted to eat the local cuisine, and the more experimental side at that. Biker Jim’s Gourmet Hot Dog Stand was certainly a great find, but I wanted to see some more “extended techniques” as well. I searched for a restaurant that could satisfy my cravings and found, to my surprise, a hotel restaurant in Westminster, CO.
Westminster is a suburb of Denver, and could be Anywhere, USA: strip malls, parking lots and franchise stores. Nothing suggests it could be a hotbed of Modern Cuisine. But apparently at O’s Steak and Seafood at the Westin Hotel, they had let a chef run wild: Ian Kleinman. He was doing a tasting menu once a week. As a matter of fact, over the last two years, he was able to push out over 100 of these menus. In a suburban hotel! Excited, I was ready to make my reservation. But there turned out to be a problem. He no longer worked there. Apparently he had left just months earlier. Well, this was a drag. I researched some more to see if he was still in town, working at another restaurant. It turns out he had started his own catering company, The Inventing Room. “We will work with any budget” his website read. I wonder if he’d cater a dinner for one? I gave him a call. I got him on the phone and explained that I wanted a single dinner catered, but I wanted to watch him cook the entire thing. In the course of our conversation, it went from dinner to a cooking lesson. This is WAY more than I had hoped for! I said I wanted to focus on different molecular techniques, the more outlandish the better. He obliged. I met him at the commissary kitchen where he prepares his meals for The Inventing Room. He had already been there preparing and had laid out his ingredients for us to work with. We riffed out a couple of dishes that would use a variety of basic techniques: spherification, culinary foam and flash freezing with liquid nitrogen. As its centerpiece, we would use transglutaminase (also known as TG or ‘meat glue’) for what could now be considered a classic Modern Cuisine idea: salmon wrapped in chicken skin. 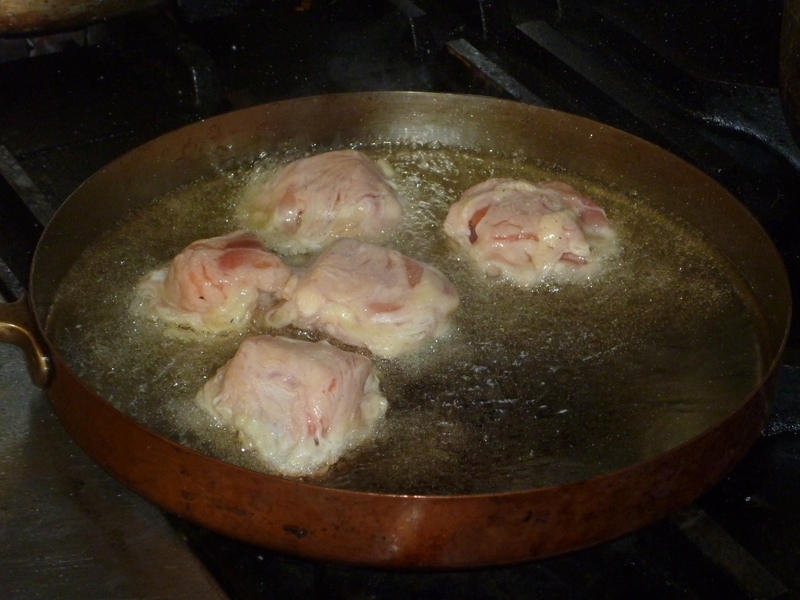 Now most would brush a slurry of TG directly on the salmon and wrap the skin onto the fish. Chef Kleinman took a different approach. After applying TG to a bunch of chicken skin, he rolled the skin up into a ball, wrapped it in plastic wrap and stuck it in the freezer. He had created a small ham of pure chicken skin. He took it to the meat slicer to make thin even slices. 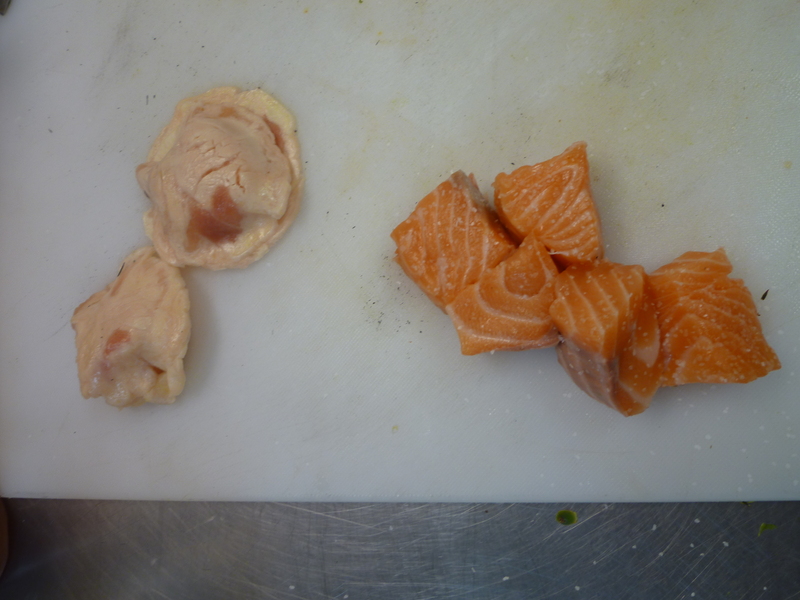 We took the slices and made little chicken skin ravioli with salmon centers. And then we fried the little suckers. 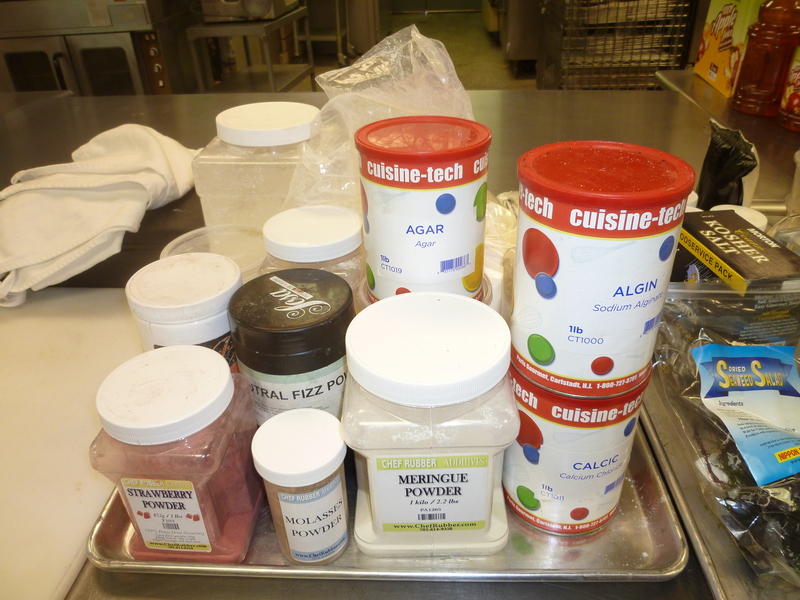 We plated it with a gelatin based sauce, which we transformed into a foam as well by adding a little lethicin. 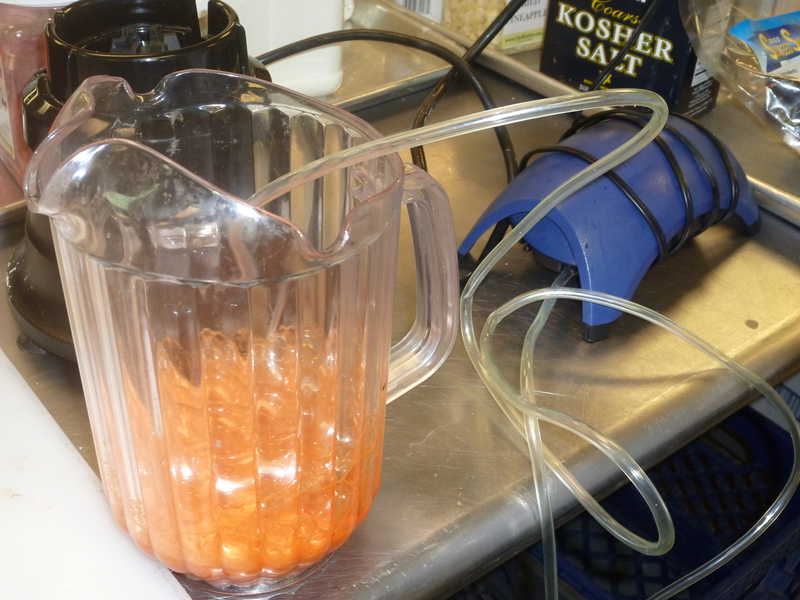 Now usually you would use an immersion blender to foam it up. But Chef Kleinman tends to think out of the box. He loves going to hardware stores to find equipment and figure out culinary uses for them. For instance, he’s taken chalk line markers to dispense candy powders. For our foam, he let an aquarium air pump doing his foaming for him while he attended to other things. 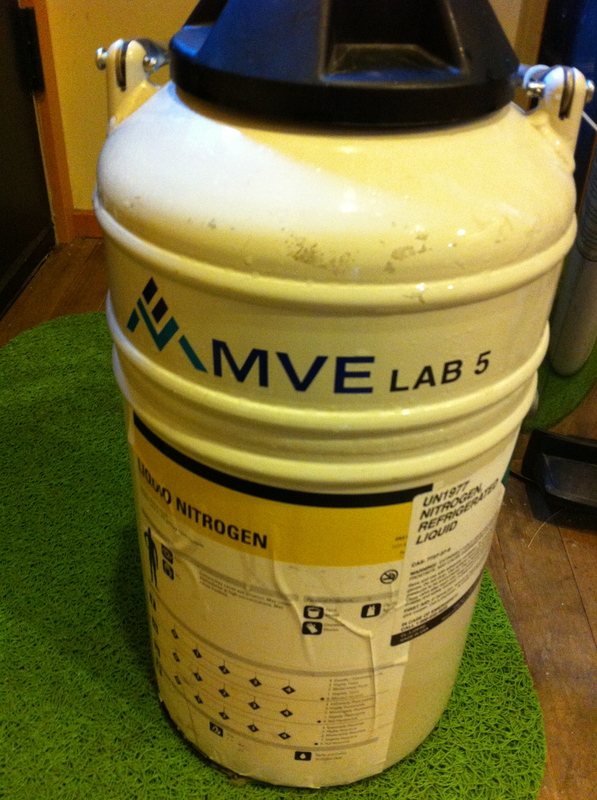 Next up we went with another modern classic: liquid nitrogen ice cream. 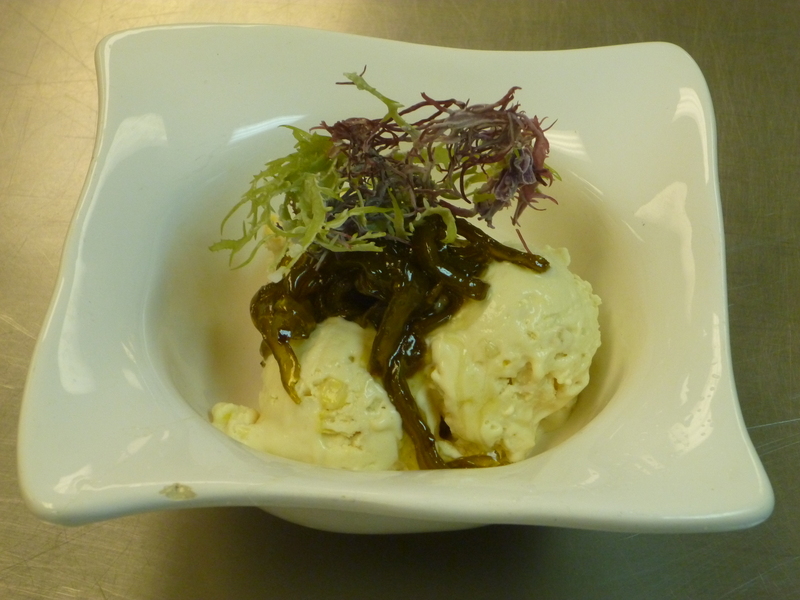 He had a huge amount of ice cream base to work from, and we decided to try something unique: a corn ice cream with caramelized cactus. After throwing together some caviar (the key: the mixture should be ‘snotty’ before dropping into the calcium chloride water bath) we flash froze some seaweed as well. 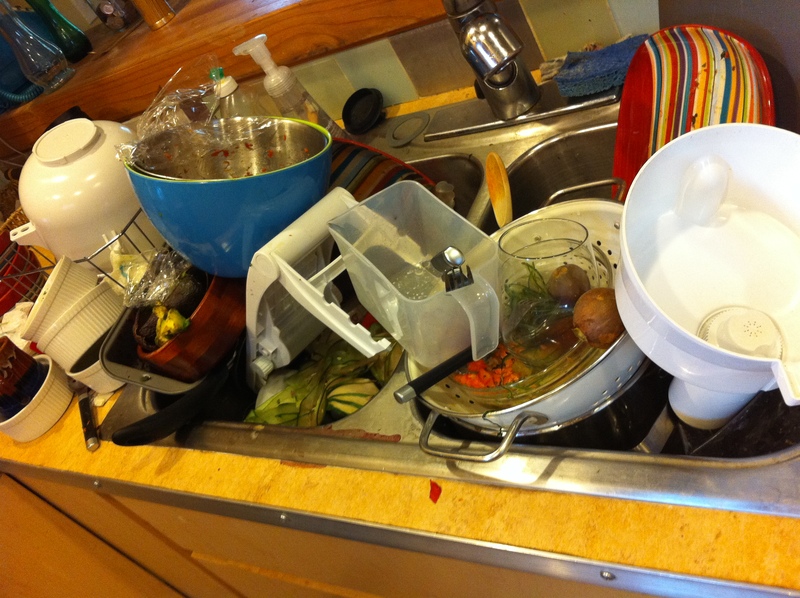 And our dishes were complete. The salmon in chicken skin was incredibly tasty and the ice cream with cactus was a pleasant surprise to both of us, since we were food pairing on the fly. It was a fantastic experience and I am very grateful that he allowed me into the kitchen to see his approach to this kind of cooking. 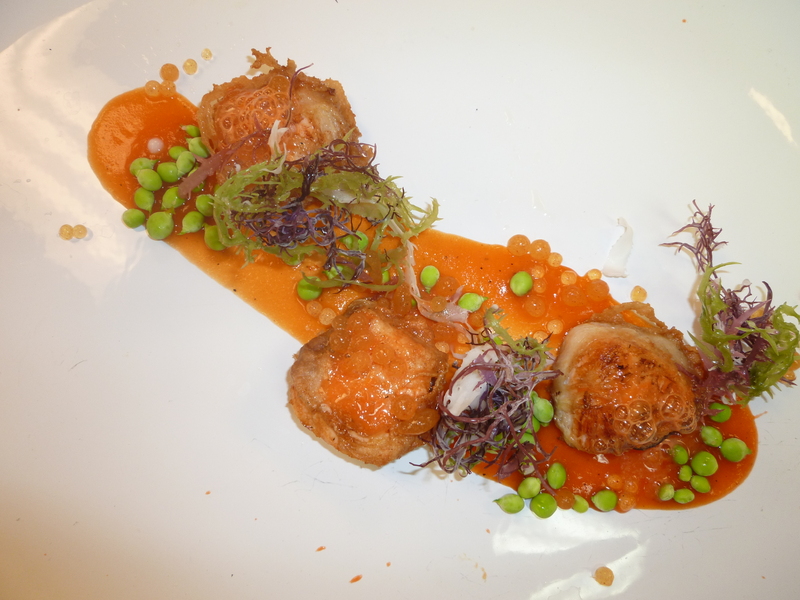 You can follow Chef Kleinman’s culinary exploits at his blog, Food 102. Thanks again, Chef! The Fat Duck Cookbook by Heston Blumenthal is the first cookbook I have ever read like a book instead of as a reference, skimming for recipes. It is a highly engaging, thoughtful, funny and educational work that sets the bar high for future cookbooks. It’s an incredible resource, and I’m sure the large volume is something else entirely. After reading Part I: History, I was excited to enter into the meat of the volume, Part II: Recipes. I looked to see what could be accomplished in a relatively short period of time, a recipe that didn’t have 58 separate preparations to be made over the course of a week before putting it all together. 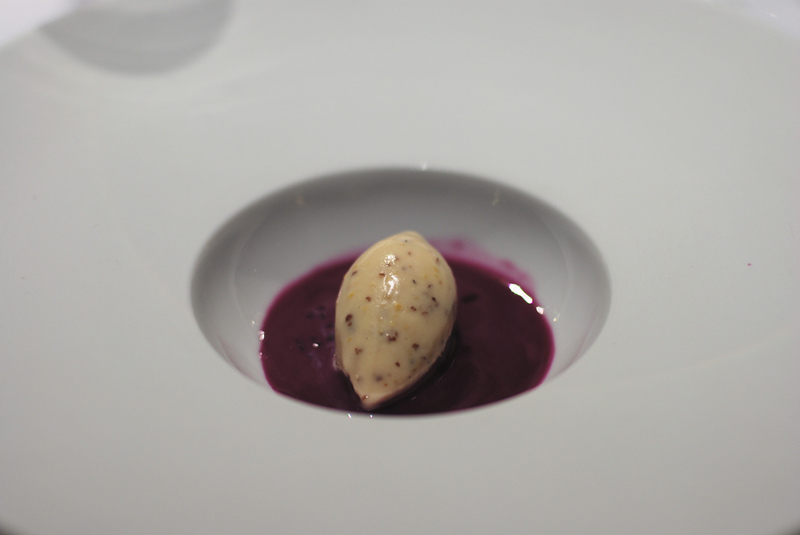 I settled on Red Cabbage Gazpacho, Pommery Grain Mustard Ice Cream. 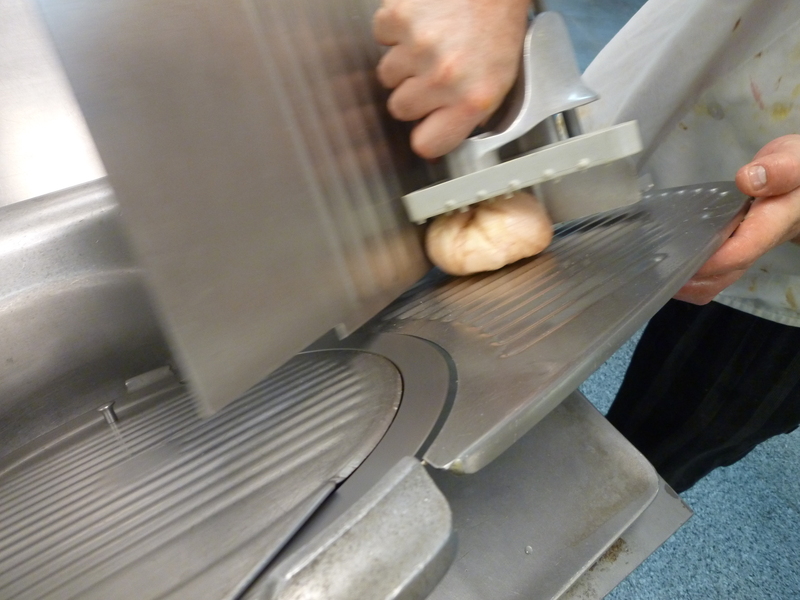 It had only four components, and the only ‘advanced’ portion was the use of a chamber vacuum sealer. Since I have one, I need to consistently justify its expense, so this was perfect. I got my shopping list in order, and collected all of the ingredients necessary. As this was my first Fat Duck dish, I decided not to cut corners, and got the best I could find. For example, the eggs and milk were local from the Pike Place Creamery, and the cucumbers from the Columbia City Farmer’s Market. Gathered all together, it seemed like a manageable task. “I can do this,” I thought to myself. And so I began my journey into the heart of The Fat Duck. I began, as can happen so often, with a variation on the dish. I searched high and low for Pommery grain mustard, but to no avail. I did find two other types of Pommery mustard, so I had to decide. Should I go with a Dijon grain mustard or a grainless Pommery? 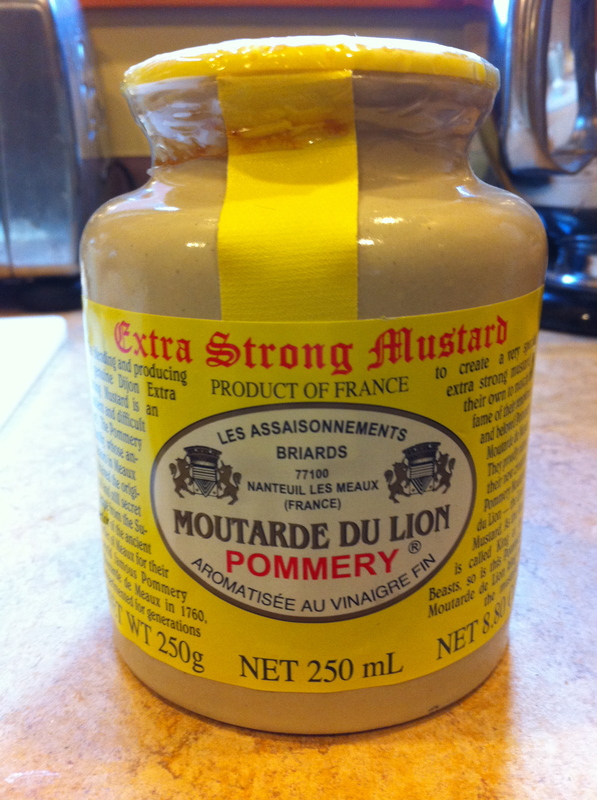 I had never had Pommery mustard before, and the recipe calls for Dijon for the mayonnaise. I figured I should go for the more authentic flavor profile the recipe asks for than the texture profile. I went grainless. Otherwise it was what one would expect, except you’re putting in mustard instead of chocolate or the like. 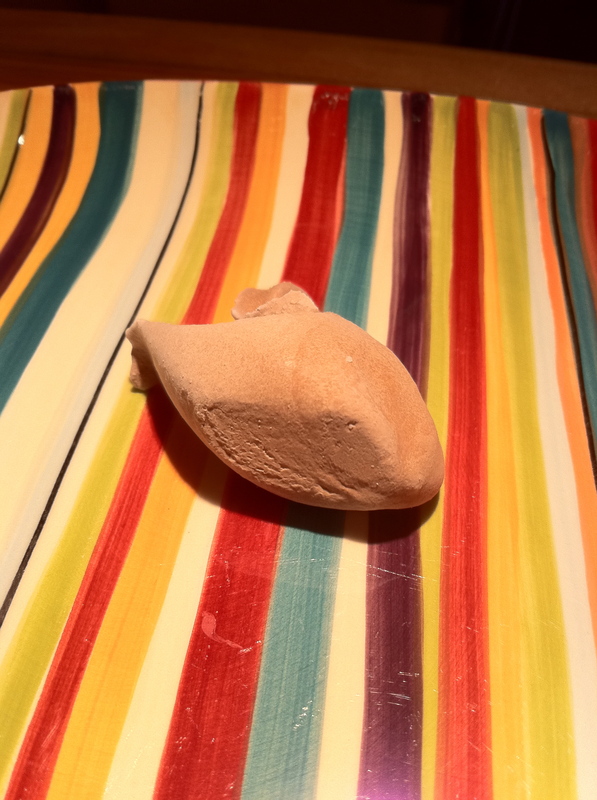 After a go in the ice cream maker, I had the first component made. 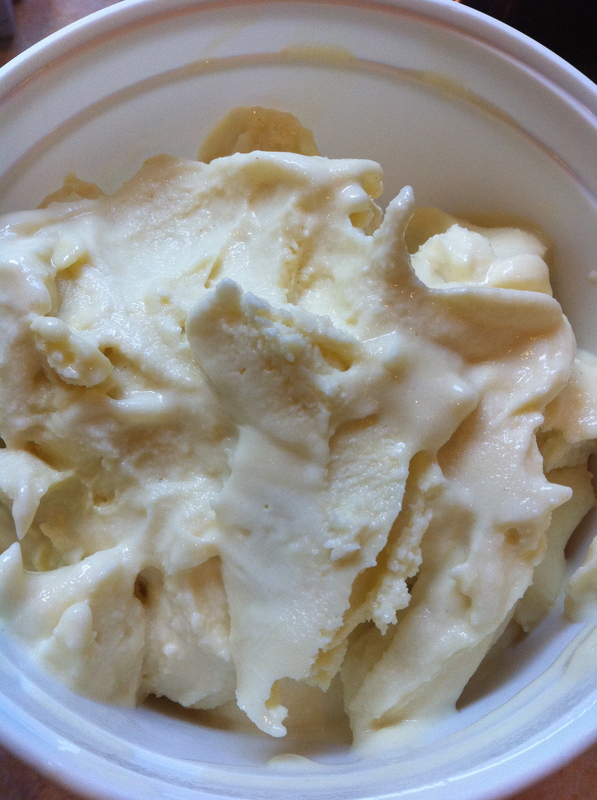 A funny thing: this was the first ice cream I’ve ever made. If you know me, it completely makes sense that it would be savory instead of sweet. Of course it is. This component calls for 30g of red wine. Since it was a riff on a Spanish dish, I figured a Spanish wine was appropriate, so I chose a bottle of Muga Rioja. Not only is this a fantastic wine but it also gave me something to drink while cooking, which seems just so perfectly breezy and debonair. It too came together quite nicely, and ended up having a wonderful extra benefit: leftovers. Adding it the following week to tuna made a quick sandwich an elevated experience. 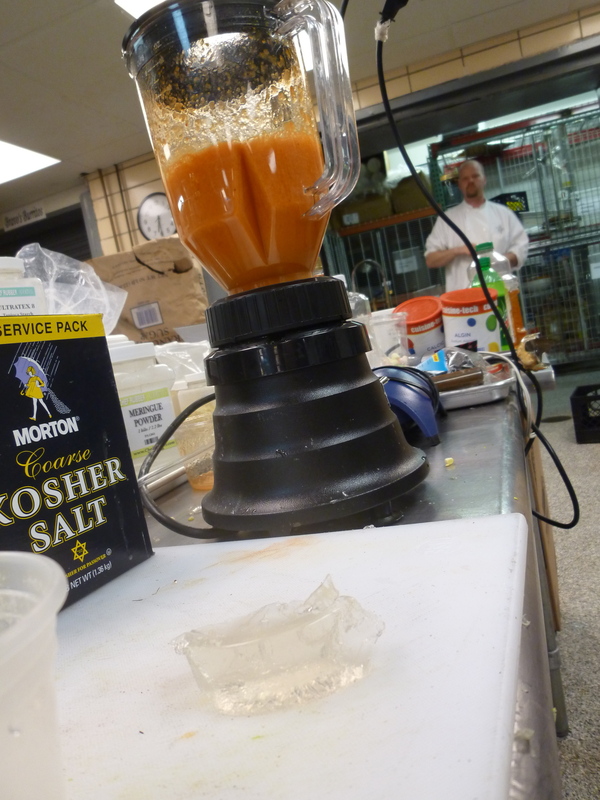 The next component up was the gazpacho itself. 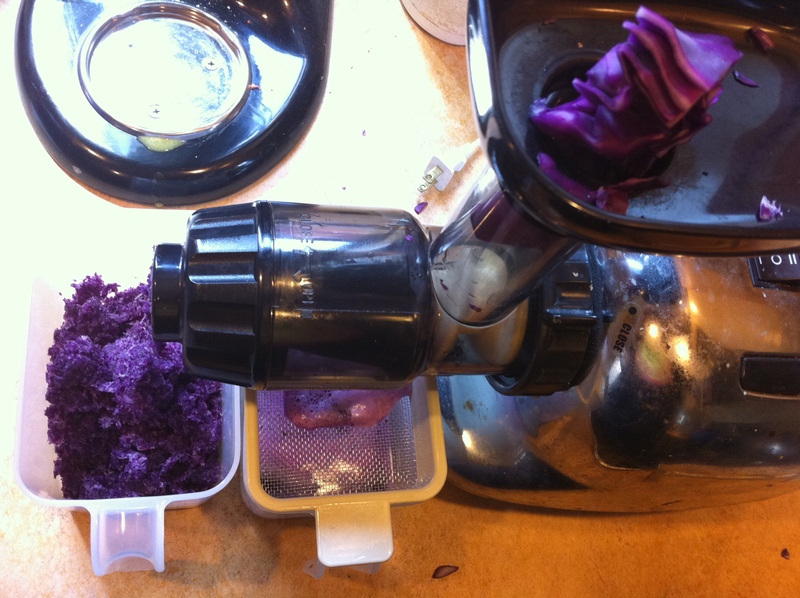 Red cabbage is such an inspired choice. The color and intense flavor of the cabbage is a real attention getter. The next step was inspired as well. In a traditional gazpacho recipe, week old bread is added to the vegetables and mushed together in a mortar. Here, he apparently wanted to have a bread flavor, but not the texture. So the recipe calls for having two pieces of bread soak in the cabbage juice for two hours, then have it strained. Finally, I added in the mayonnaise with some red wine vinegar and salt. 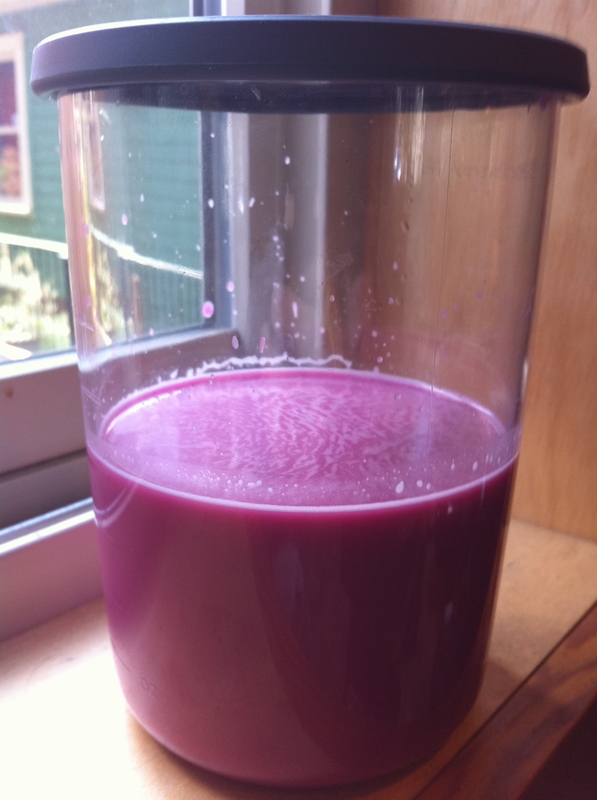 My first gazpacho was made, and it was a brilliant fuchsia. I saved this for last because this was going to be simple. I mean, there’s only one ingredient: cucumbers. I was terribly mistaken. 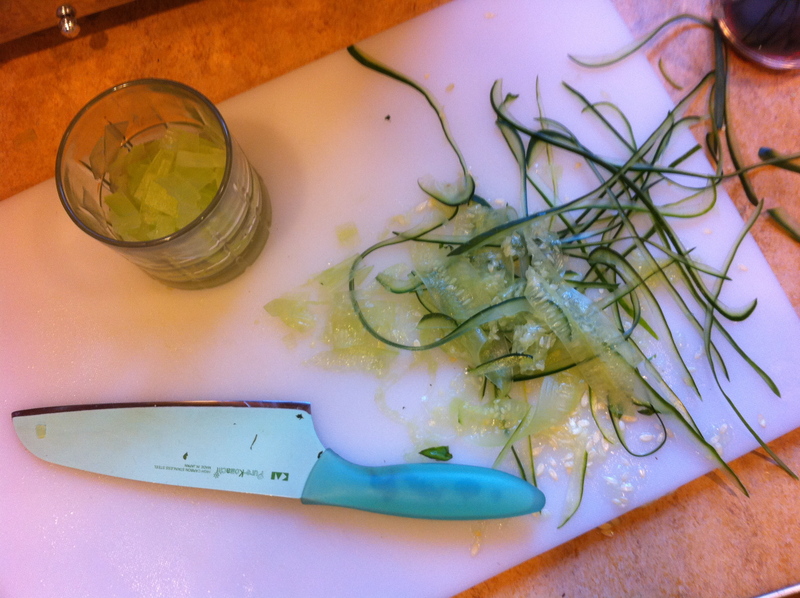 First, the cucumber needed to be sliced with a mandolin. I had gone earlier into a Ross “Dress for Less” store to grab one. Yes, this too was my first time using a mandolin. I have made coffee caviar and perfect sous vide eggs, but never had needed to slice anything thinly and uniformly. I know, backwards. That’s how I do it. 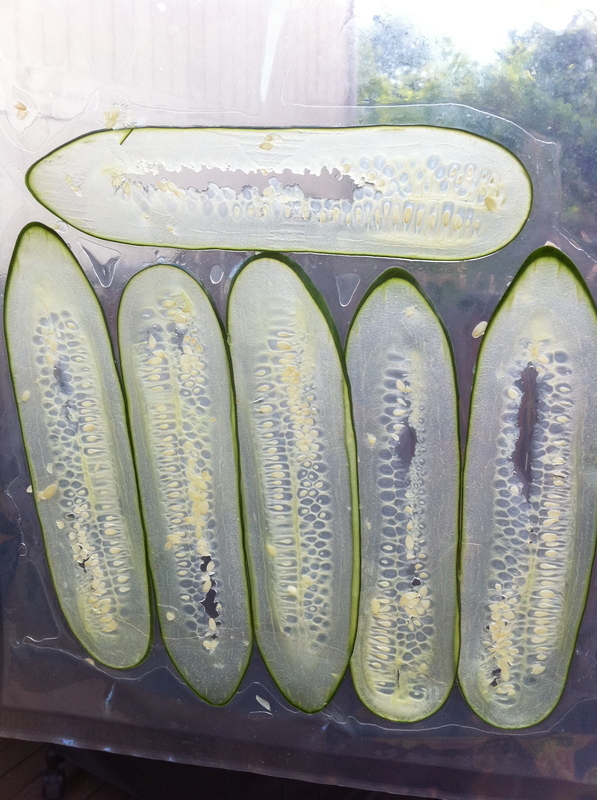 As air is removed and the sous-vide bag constricts, the cucumber compresses, breaking the cell walls in an even, controlled fashion and allowing the juice they contain to combine. Repeating the processes condenses and concentrates further. When the cucumber is removed from the bag it retains its structure but has a denser texture, a fuller flavour and – because of the removal of the air – a more intense jade-green colour. I thought it was interesting that he requires the vacuum process twice. Once I did it though, it became clear. Literally. 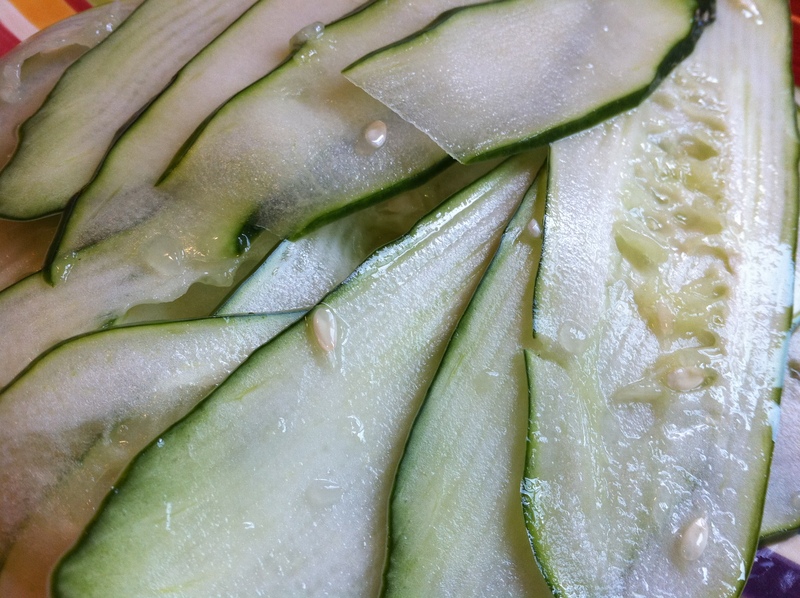 Remove the cucumber from the bag, then trim off and discard the skin and seeds. This proved to almost be my undoing. From such a simple instruction was launched a time intensive display of tedious, repetitive, meticulous surgery. Slice after slice of paper thin cucumber went under my knife. My dinner guests were arriving shortly, and I had other things I needed to attend to. I hadn’t prepared for such drudgery. It was an important lesson in not only reading a recipe but visualizing the steps in order to make sure you know what you’re getting into. But the result was worth it. Little jade chips of cucumber. They were so cool. Genius, really. With all the components created, all that was needed was to put it together. Here I strayed from the recipe. It calls for 2g of cucumbers to be plated. At this point, this was course three of five for the dinner and I was just trying to get it out on the table, so I put what looked right to me. I plunked down some cucumber, a rocher of ice cream (yes, you guessed it – my first attempt at making quenelles), and poured the gazpacho in. It was a delicious, if complex, interplay of flavors. The sharpness of the red cabbage came at you first, and up to a point where it could be too much, but then the mayonnaise came in to soften the blow, with bright notes underneath from the cucumber. The creaminess of the mustard ice cream had a fantastic texture counterpoint with the crunchiness of the cucumber brunoise. I think if there was grain in the mustard, that would have been another texture that really would enhance the dish. Regardless, it was a complete success. I certainly got my portions wrong, but the color is what intrigues me the most. I had that color before I added the mayonnaise. 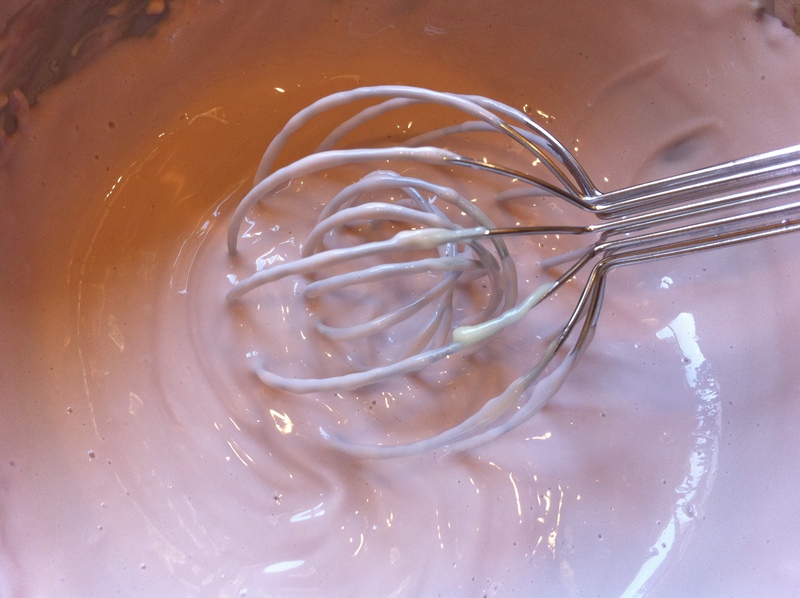 But once I did (with exact measurements per the recipe, of course), the color changed. Somehow his has not. Perhaps the mayonnaise sits underneath the ice cream? Contact me if you happen to know. Otherwise, I suppose I’ll have to fly out to Bray myself and find out. But I can’t beat myself up too much. Less than nine months prior, I was ordering take out teriyaki to feed myself. Now I was serving a dish from one of the best restaurants in the world to my friends that I made in my little kitchen. I thought I could do it, and I did. Now I have my eye on the Salmon Poached in a Liquorice Gel. Why not? But first, I have some cleaning up to do. Update 9/22/10: Since posting this, I did a little Google image search on “red cabbage gazpacho fat duck” and found several pictures from The Fat Duck where the color of the gazpacho matches my own. Seems the color is more an issue of lighting and camera ability than the dish itself. Nice to see they didn’t water down the cookbook and keep the secret all to themselves! 1. 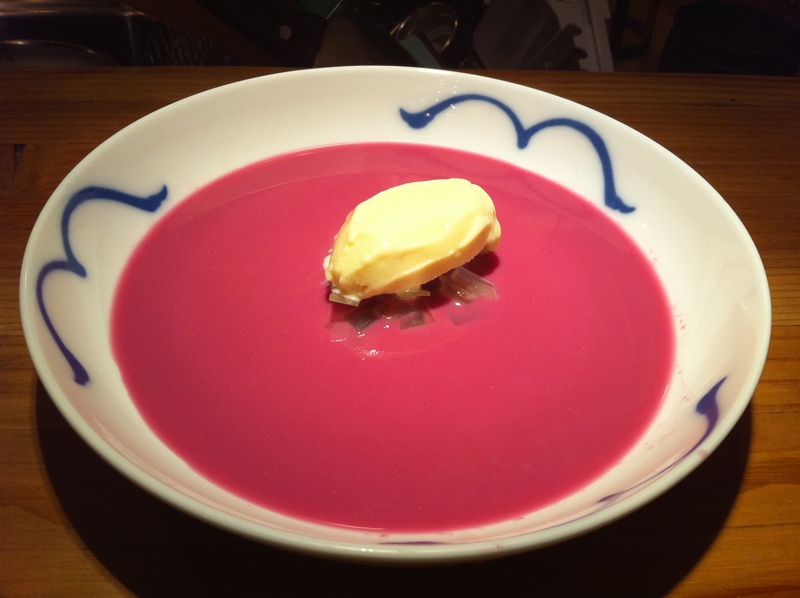 There was less mayonnaise used in the dish in the Fat Duck picture – it is correct to mix the mayonnaise with the red cabbage but it would appear that the photograph is a particularly dark colour. It is usually somewhere in between this dark version and your fuchsia version. Less mayonnaise would make it a little darker but no less pink which makes me think that suggestion no 2 could be the problem? 2. 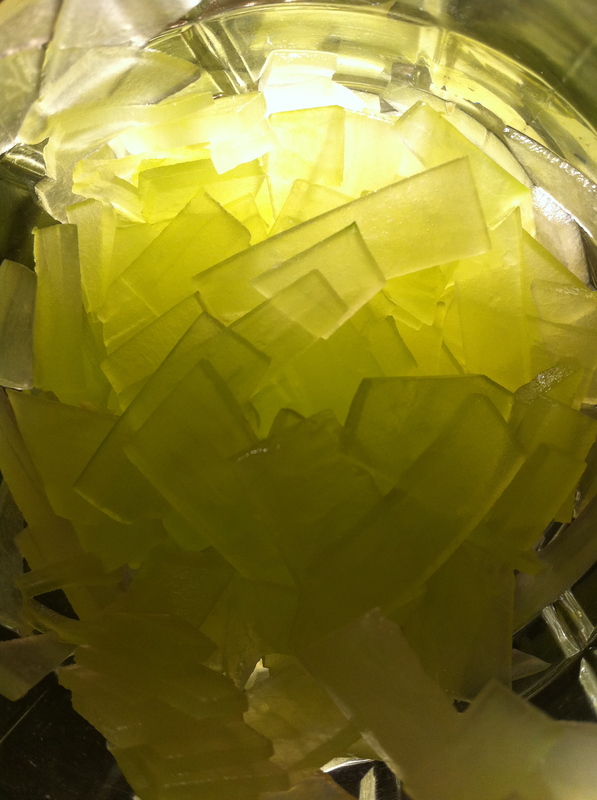 Too much of the white of the cabbage has been juiced with the leaves – at the Fat Duck, they are extremely vigilant and obsessive when it comes to cutting out all the white parts of the cabbage (it is easy to expect this level of attention to detail when you have 36 chefs!). 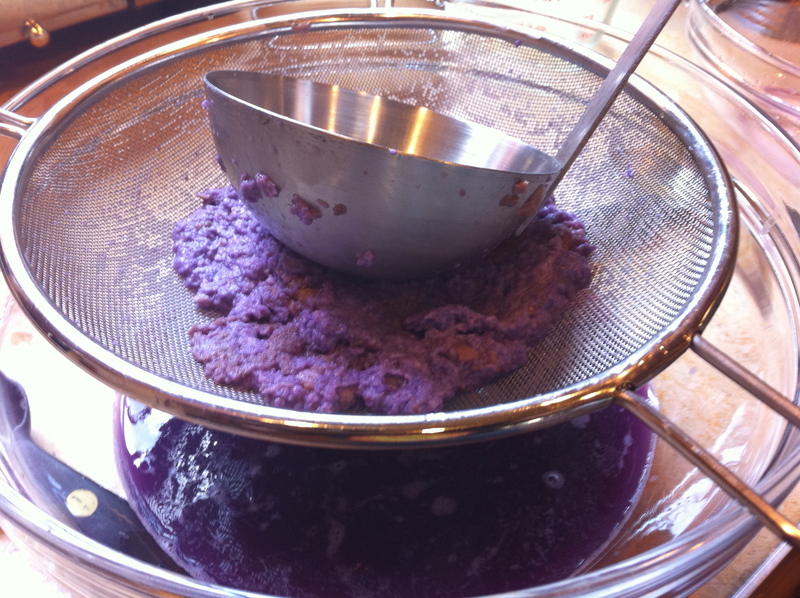 It is wasteful but it guarantees a glorious purple colour rather than a pinker colour. Might this have been the problem? 3. Or it could just be your particular cabbage! According to the chefs, the colour of the soup does vary from time to time. It could be due to the season or the size of the cabbage or simply how fresh it is – no one is quite sure. I do hope you try again and get better, more purple results. Personally, I think it tastes good whatever the colour! I commend them for taking the time to write a home cook across the ocean to help out with minor details such as the color. Although I did core the cabbage, I didn’t carefully strip out all the white, so that along with the amount of mayonnaise most likely was the culprit. I am now prepared for the next time I give it a go!